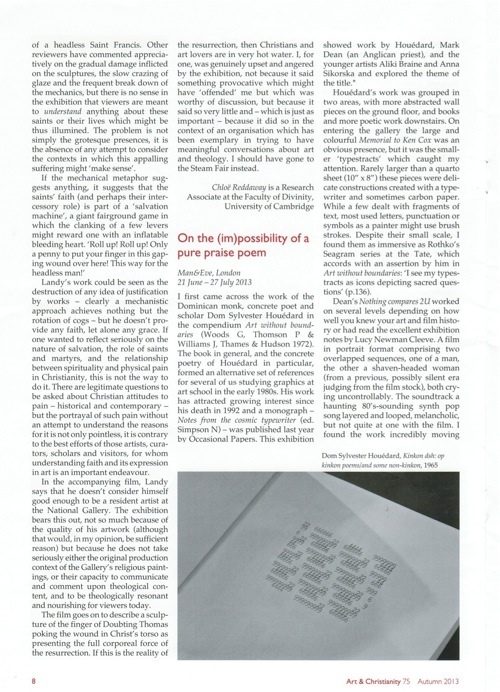 In an interview with Ian MacMillan in 2006, the poet Geoffrey Hill spoke about “the impossibility of a pure praise poem.” Hill’s bold assertion forms the basis of enquiry for this exhibition, which brings together work by the late Benedictine priest, theologian and Concrete poet Dom Sylvester Houédard (aka dsh), with work by three contemporary artists: Aliki Braine, Mark Dean and Anna Sikorska. The exhibition explores, in various media, whether the creative act and its product can ever comprise ‘pure praise’, or whether the incidence of a ‘pure praise poem’ (or equally of a pure praise photograph, painting, video or sculpture) is unattainable. A number of intriguing symmetries occur within the exhibition, not least the fact that it includes work made by two ordained priests (dsh and Dean). dsh understood his visual poems and ‘typestracts’ as “icons depicting sacred questions,” and Dean’s video works, which have been described by David Curtis as “votive offerings”, also function in the interrogative mode. In each case, there is a tacit acceptance that answers will not be forthcoming. For dsh, questions are met with mysteries, “to which the appropriate response can never be an ‘answer’ but has to be a growth of awareness and awe – gratitude, depth and pleasure.” This attitude of praise defines the creative act, but cannot necessarily be conveyed to the viewer who joins with the artist in constructing the meaning of the work. dsh frequently affirmed the Dadaist principle that “the logos and the ikon are one.” Elsewhere, he wrote, “it is possible to think in images alone – in diagrams, models, gestures and muscular movements – as well as in words alone.” This recognition of the primacy of visual/tactile forms of language is also central to Dean’s work, in which the categories should also be extended to include music. In Dean’s work, the logos functions as a vessel or carrier of meaning, in much the same way as the ikon, whilst the juxtaposition of logos and ikon exponentially increase the possibilities of interpretation. Dean’s ‘Ascension (nothing/Something Good)’ (1999), bears a striking visual resemblance to dsh’s ‘Ken Cox Memorial’ (1968). Both works deal with the tension between absence and ‘something good’. dsh produced his memorial in response to the untimely death of the illustrator, poet and musician Ken Cox. The design of the print includes all the letters of the alphabet, except for those from the name ‘Ken Cox’ as if to reflect the fact that he is now absent from the world. The remaining letters cascade out from a central point in eight colourful spokes or letters. The visual design hints at mandala, and the natural inclination is to look for a pattern or meaning in the placement of the letters, but there is none to be found. There are no answers to this death and absence, only a visual celebration of the good that remains and an opportunity to reflect. In ‘Ascension (nothing/Something Good)’, seven spokes of animated white type emanate from a central void and appear against a black background, each one spelling out the word ‘nothing’. The text disappears off the edge of the screen, and this continues in a never-ending loop. The accompanying soundtrack is a brief sample of Julie Andrews and Christopher Plummer singing the love duet ‘Something Good’, from the 1965 film version of Rogers and Hammerstein’s ‘The Sound of Music’. This sample is also looped, so that the words of its title are repeated endlessly but the pitch is sequentially modified so that they are constantly ascending the scale. This approach, of holding two contrasting ideas in juxtaposition and allowing each one to interrupt and refine the other, is typical of Dean’s work. It is a form of disputation that consciously appeals to earlier Biblical and religious precedents including the rabbinical practice of g’zerah shavah. In g’zerah shavah, similar words from different Biblical passages are associated with each other in order to reason by analogy. In so doing, the meaning and related context from one verse is imported into the other. This kind of rabbinical disputation is not just a component of the interpretation of the Bible, but of the Bible itself, as seen in the accounts of the Prophets taking issue with their culture, or of Abraham and Sarah arguing with God (Genesis 18:10-15; 22-33). It is also found in the Psalms in which the author often moves from a position of despair and distress to one of praise within a few lines or stanzas. The psalms reflect honestly the full range of human experience and often question God as to why he has abandoned his people or forgotten his promises. They express doubt and confusion, but they also offer up praise. ‘Nothing Compares 2 U (Bas Jan Ader Mirrors Joan of Arc)’ functions rather like a psalm in its presentation of human distress and desolation co-existing with an expression of faith in God, even at the cost of martyrdom. Two video images are superimposed and offset so that the screen is divided into three horizontal bands, which appear and disappear as the video progresses. The top half is filled with a short extract from the silent film ‘La Passion de Jeanne d’Arc’ (1928) directed by Carl Theodor Dreyer and starring Renée Jeanne (aka ‘Maria’) Falconetti. The clip that Dean has selected is taken from Joan’s trial, when she has been accused and asked whether she believes that God will save her from prison. Having replied ‘yes’, she is then asked ‘when?’. At this moment a tear falls down her cheek and she replies, “I know neither the day nor the hour”. The subtitles from the original film appear in French across the centre of the screen. The lower section of the screen appropriates the iconic work ‘I’m too sad to tell you’ (1971) by the late and much mythologized Bas Jan Ader, which consists of the artist crying in front of the camera with no indication of the cause of his sadness (although we may posthumously consider the title of his last work, ‘In Search of the Miraculous’, where he set sail across the Atlantic to return to his homeland, only to disappear at sea). The potency and prior signification of the original material Dean has sampled risks criticism. Indeed, given the iconic status of his sources within the canon of modern and contemporary art, he might even be accused of a kind of sacrilege. However, the question is complicated by his pointed use of other appropriations within the work: in the image, Bas Jan Ader mirroring Joan of Arc; in the title Sinead O’Connor doing likewise; in the sound, Mirrors covering an iconic 70’s song in an 80’s fashion; even Falconetti’s extraordinary portrayal of Joan of Arc has become inseparable from her own identity. These actions pose the question of why Dean is doing likewise: is his appropriation in the service of his own artistic ambition, or for some higher purpose? This question, within these layers of signification becomes part of the construction of the work, rendering it pregnant with cathartic possibilities. I first came across the work of the Dominican monk, concrete poet and scholar Dom Sylvester Houédard in the compendium Art without boundaries (Woods G, Thomson P & Williams J, Thames & Hudson 1972). Houédard’s work was grouped in two areas, with more abstracted wall pieces on the ground floor, and books and more poetic work downstairs. On entering the gallery the large and colourful ‘Memorial to Ken Kox’ was an obvious presence, but it was the smaller ‘typestracts’ which caught my attention. Rarely larger than a quarto sheet (10” x 8”) these pieces were delicate constructions created with a typewriter and sometimes carbon paper. While a few dealt with fragments of text, most used letters, punctuation or symbols a painter might use a brush stroke. Despite their small scale, I found them immersive as Rothko’s ‘Seagram’ series at the Tate, which accords with an assertion by him in Art without boundaries: ‘I see my typestracts as icons depicting sacred questions’ (p.136). Dean’s ‘Nothing Compares 2 U’ worked on several levels depending on how well you knew your art and film history or had read the excellent exhibition notes by Lucy Newman Cleeve. A film in portrait format comprising two overlapped sequences, one of a man, the other of a shaven headed woman (from a previous, possibly silent era judging from the film stock), both crying uncontrollably. The soundtrack a haunting 80’s sounding synth pop song layered and looped, melancholic, but not quite at one with the film. I found the work incredibly moving without knowing the references: a pairing of Maria Falconetti in the film ‘La passion de Jeanne d’Arc’ (1928), with part of ‘I’m too sad to tell you’ (1970) by Bas Jan Ader, to the soundtrack of a remixed version of the Mirrors’ cover (2011) of Dino Valenti’s ‘Something’s on your mind’ (Karen Dalton, 1971). These aspects of layering, not immediately obvious – and arguably not strictly necessary to its appreciation – added weight to the work and suggest an interest in the materiality of process which was common to all four artists. For Houédard the typewriter was pushed to the limits: letters were used as marks; conventions of line spacing were ignored; the sheet was worked, then taken out and re-worked, sometimes several times; if a coloured ribbon couldn’t be found, carbon paper was used. In Braine’s work – aptly described as ‘concrete photography’ – the substance of analogue photographic film is clearly evident. With no image exposed, the print reveals the substance of the film itself, slightly scratched and real, interrupted by either punched holes or applied stickers. Sikorska’s interest in material is slightly different and perhaps more open to ambiguity than the others. The works ‘Colosseum’ and ‘St Andrew unadorned’ play with the visual similarities between title and object, but material differences: between the titled object and the art object, and between the art object and that object’s original material. Here a knowledge of the title is critical to unlocking the work, and the sense of materiality, and her play with it, was less immediately obvious. Man&Eve must be congratulated on bringing this body of work together. The exhibition title can be taken two ways. I’m sure for many the work provided a vibrant affirmation that a pure praise poem is indeed possible, for others it opened their eyes to at least the possibility. Phil Baines is a Graphic designer and Professor of Typography at Central St Martins, University of the Arts London.